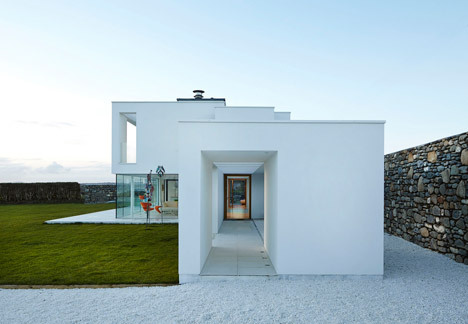 This family home nestled against the remnants of an ancient stone cottage on the Welsh coast features a composition inspired by the client’s interest in abstract art . 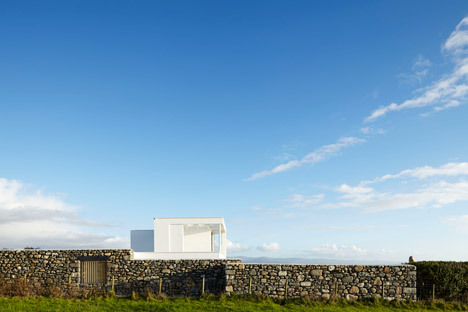 Cefn Castell is a three-bedroom property designed by Manchester-based architecture practice Stephenson Studio on the west coast of Wales, overlooking Cardigan Bay – an inlet from the Irish Sea. The design of the house takes its cues from the client’s love of the linear patterns and block colours present in abstract art. 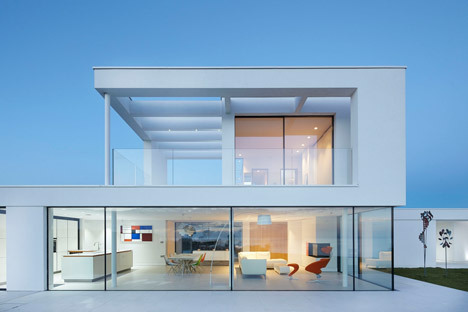 Large expanses of transparent glass that maximise sea views are framed by sections of pristine white wall, defining the house into a series of boxes that mirror the regimented floor plan. A primary-coloured Mondrian-styled painting that hangs on the wall of the living room is actually a simplified version of the building’s plan and outlines its grid-like organisation. A small upper storey containing a master bedroom and balcony perches on top of the ground floor like an observation tower. 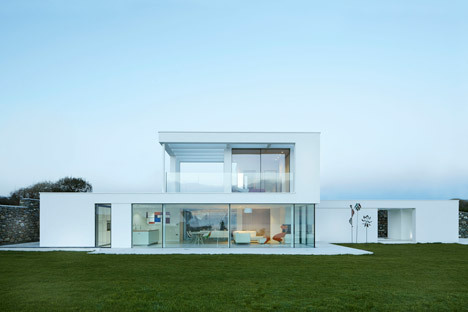 “The extrusion of the first floor references the maritime theme of coastal observation stations, whilst massing up the approach view of the house set within its own private walled courtyard,” said the architects. At the rear of the property, a long outdoor walkway runs along a stone wall that is part of the ruins of a cottage that once stood on the site. 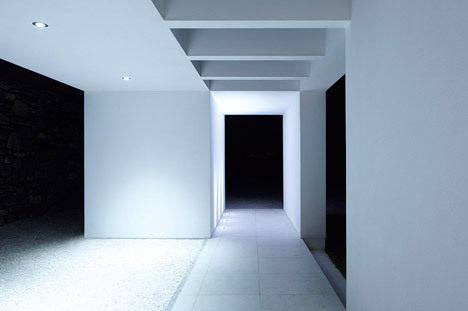 Outdoor utility spaces including bin storage are located under a portico-like structure that brackets this pathway. 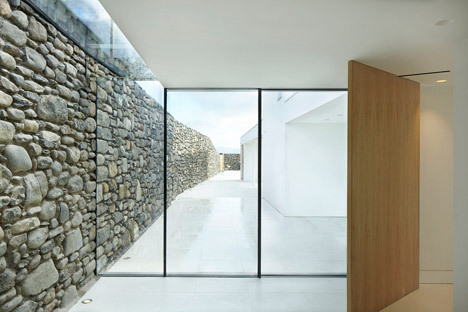 The stone wall extends out on either side of the new property, providing a perimeter wall and sheltering a patio by a glazed ground-floor bedroom at the rear. A sliver of glass runs along the roof of this bedroom, separating the new build from the ruins. 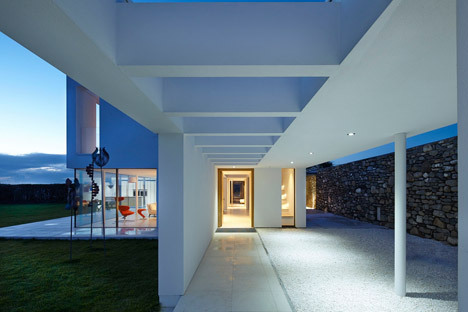 “The stone remains of a 400-year-old cottage were re-used for the new boundary wall, offering privacy and textural contrast of the traditional juxtaposing the new,” said the design team. 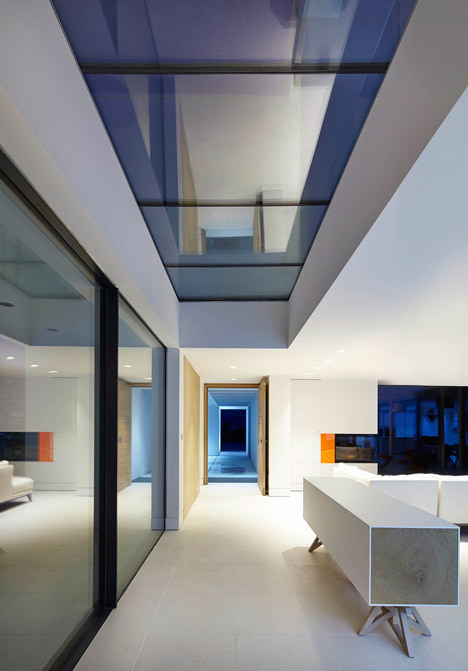 “The new house separates from the wall with a glass slot roof, visually suggesting the house delicately ‘kisses’ the wall,” the team added. 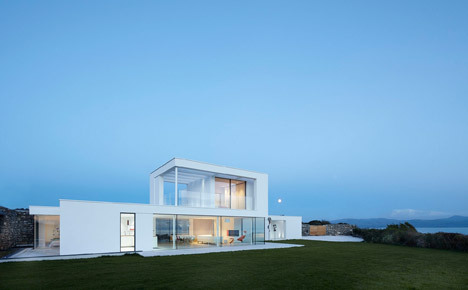 A combined living room, kitchen and dining area occupies the front of the ground floor, nearest the sea. Two ground-floor bedrooms and a utility room can be separated from this open-plan space by pivoting wooden doors. 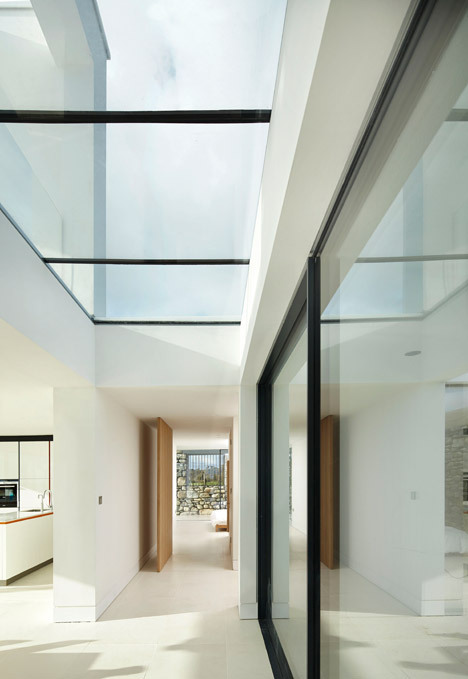 Floor-to-ceiling glazing slides back from the neutral-toned space onto a pale grey terrace in front of the property, and to the more secluded terrace to the rear. A sliding glass screen opens to the external secluded courtyard into the plan of the living spaces. Two bedrooms have been arranged to provide closure of the plan to the private inner courtyard. Photography is by Andrew Wall.